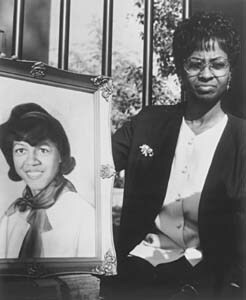 A Sister's Grief: Shirley Wesley King holds up a picture of her murdered sister, Cynthia Wesley. CIVIL RIGHTS has taken on a new kind of struggle within recent cinema: a battle of representation wherein white-knight fictions like Ghosts of Mississippi and A Time to Kill are created for mass consumption, while truthful documentaries like Freedom on My Mind and Spike Lee's 4 Little Girls (Feb. 23, 26, 28 and March 1 on HBO) play only a handful of specialized venues en route to the small screen. Befitting the movement itself, this filmic business-as-usual supplies an ideal context for activism. Indeed, it has enabled Lee to launch another perfectly timed counteroffensive: a calmly wrenching mix of oral history and period newsreels recalling the fateful Sunday in mid-September 1963 when a white supremacist's bomb took the lives of four churchgoing black girls in Birmingham, Ala.
Lee has expressed his belief that no other black filmmaker could have secured the meager $1 million budget for this project, and 4 Little Girls is political mainly by virtue of having been made. Accordingly, it's the director's most purely mournful work, a memorial service in a time of historical amnesia. Melancholy from its first frames, 4 Little Girls opens with a long tracking shot through a cemetery, intercut with '60s images of segregated bathrooms, Klu Klux Klan marches, police with attack dogs and lynched black bodies. It's Lee's way of drawing an immediate connection between the social climate and its consequences; but those tombstones also announce this as the story, first and foremost, of four little girls. Family interviews and old photos sketch four distinct personalities. Carole Robertson was a Girl Scout who was carrying a Bible at the time of the bombing; her sister recalls sitting with her in a movie-theater balcony, tossing popcorn on the white people below. Cynthia Wesley is immortalized by a friend who remembers the bright look in her eyes the last time he saw her. Addie Mae Collins was a sensitive young soul who held a funeral ceremony for a dead bird. And Denise McNair once asked her dad pointblank to explain why she couldn't get a sandwich from a segregated lunch counter. "I'm not sure if she ever understood," her father says into the camera. Lee, sitting off-screen, brings it even closer to home: "How did she feel?" Viewing race politics through a personal lens, 4 Little Girls nevertheless puts the tragedy in context. The year 1963 began with Alabama governor George Wallace's pro-segregation speech that he later enforced by blocking a doorway at the state university. By spring, the volatile town of Birmingham became the locus of both resistance and violence as peaceful petitions to integrate department stores were met with rampant police brutality, the arrest of Martin Luther King Jr. and President Kennedy's deployment of 3,000 National Guard troops to the city. The film's footage of police commissioner and mayoral candidate Bull Connor driving an armored tank through black neighborhoods reveals the freedom with which white-supremacist terror was perpetrated. Then, only two weeks after King's "I Have a Dream" speech in Washington, a bomb tore through the basement of the Sixteenth Street Baptist Church in Birmingham, killing the four girls--one age 11, the others 14--who were there to attend Sunday school. Lee makes plain the irony that this devastating event was also a radicalizing one. "We were able to transform a crucifixion into a resurrection," says Jesse Jackson, while retired newscaster Walter Cronkite opines, "I don't think the white community realized the depth of hate until then." IN ITS WAY, 4 Little Girls aims to function similarly as a catalyst. The film invokes the recent resurgence of church burning with TV news footage from 1994 and exposes the ailing Wallace's pathetic attempts to finesse his own character by referring to his black assistant as "my best friend." Lee also includes brief glimpses of the horrible morgue photos of the girls' torn bodies and scenes from 1977 showing the indictment of a grinning former Klan member named Robert "Dynamite Bob" Chambliss. In so doing, one of Lee's projects is to chart from past to present the course of all that powerful energy: the outrage and grief, the activism in fighting for justice or in simply coping. "How does your anger come out?" he asks one of the girls' mothers--and part of what he's getting at is, "How can we harness it?" This is a more contemplative sort of anger than Lee showed in the first phase of his career. Back in 1992, he kicked off Malcolm X with clips from the Rodney King beating while the American flag burned to a crisp "X"--an astonishing feat within the studio system. Then came his second, daringly uncommercial phase: the beautifully impressionistic Crooklyn, the hood-film eulogy Clockers and last year's Get on the Bus, a fully collaborative, documentarylike work of fictionalized history and one of the more creatively conceived and financed indies ever released as a studio film. Made for HBO, 4 Little Girls is in some ways more indie than Lee has ever been. It's the straightforward work of a filmmaker with a camera, asking questions, reckoning with history and helping it along. The auteur is clearly at the top of his game, and yet one of the many great things about this film is that its real triumph is not Spike Lee's. 4 Little Girls airs Feb. 23 at 9pm, Feb. 26 at 11:15am and 7:15pm, Feb. 28 at 5pm and March 1 at 10:15pm on HBO. From the February 19-25, 1998 issue of Metro.